Nick volunteers to create awareness about the national campaign to stop usage of the R-word. Sometimes he speaks in front of a single class, sometimes in an auditorium for several classes, and sometimes for a youth group or other gathering in the community. He might also share his thoughts with an individual. The following is a transcript of the presentation he uses. Hi there. My name is Nick. Thanks for having me in your classroom today. I’m so pumped to be here with you to talk about one little word that begins with the letter R, and can be very hurtful. The word is: Retard. The Spread the Word to End the Word Campaign is a national awareness organization started by students, that helps people who feel the same way as me. Here are a few videos from their website that show the impact the R-word can have on individuals. Who Do You Call The R-Word? As you already know, the words we say are very powerful. Using this one single word: Retard, can make people with intellectual disabilities feel less of a person. Sometimes I hear people use the R word as an insult to another person. I believe they are not really trying to hurt others, but it definitely can hurt. I believe they probably don’t understand how very hurtful this word might feel to someone else, maybe even someone like me. Just like anyone else, I don’t like to be labeled or referred to as anything less than the person who I am. Maybe if you take a bit of time to get to know me, you’ll understand that although I may not talk or move like you, I’m still a person with lots of hopes and goals, just the same as you. I’d like to show you a couple of short videos about myself so you can get to know me better. As you’ve seen, I really like to participate in many of the same activities that you guys do. One of my favorite sports is waterskiing. I love jumping over the wake and even catching some air! I’m wondering if it’s that sort of fun that makes me an adrenaline junkie! Oh yeah! With a little help I can do most of the same things that you do, but it may look a little different and take a few more really awesome people to make it happen. But dude! the fun is just the same. One thing I’ve learned and want to share today, is that very often you are limited only by your own imagination. I hope you’ll be like me, and whatever you really want to do, just make the decision. Ask for help if you need to. And then with all you’ve got: Go for it! Go for your goal! When I’m not out having fun, I work on my business, Awesome in Action. I’m writing children’s books about my life in Africa, where I grew up. 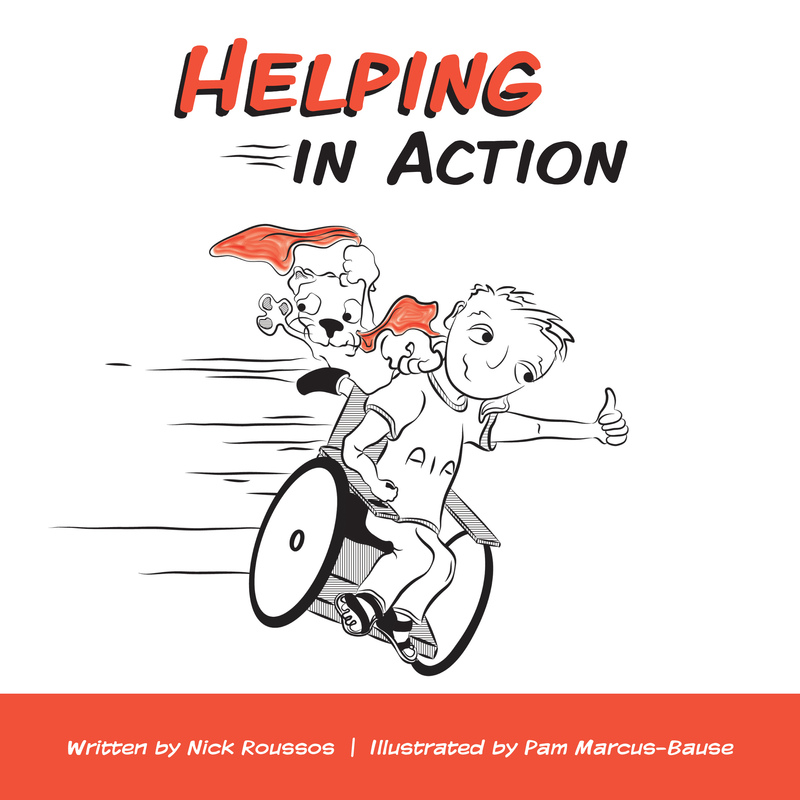 My first book, Helping in Action will be published and available at the end of this year. 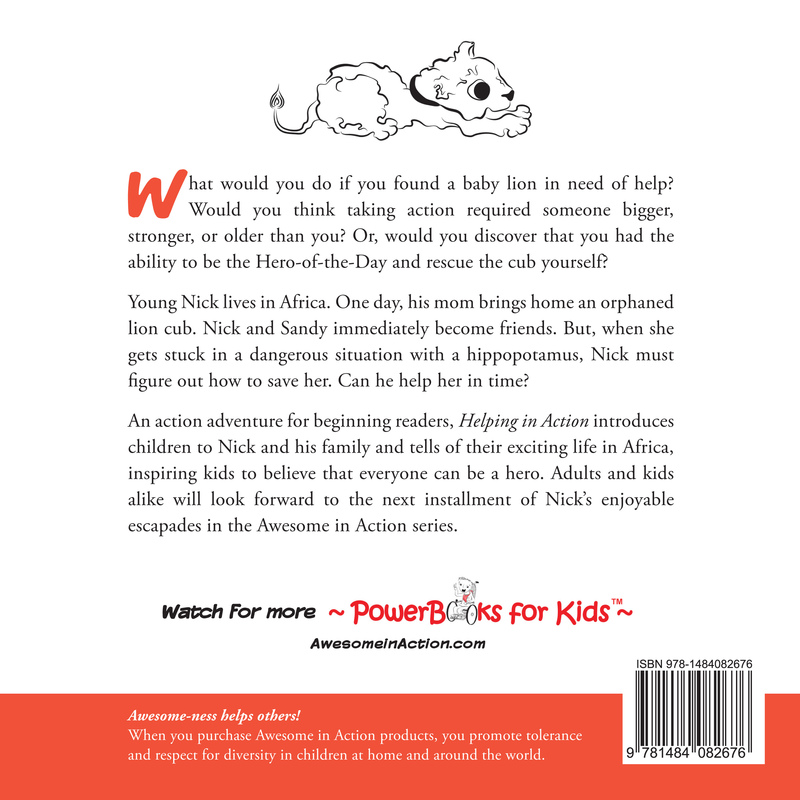 If you’d like, you’re welcome to have (or download) a Helping in Action bookmark that tells a bit more about my latest project. Today, I’d like to leave you with one simple request: Think before you speak! The words you choose can really affect the people who hear them! We all live in one community. One world. And you can make it better for everyone if we show each other the same amount of respect that we would expect for ourselves and our loved ones. Today, I’d like to ask you to considering making a pledge to stop using the R-word, and to talk to others about not using it. A pledge is like a promise, and to show that you promise to stop using the R-word, you can take the pledge. You can be proud of your participation in this very important campaign that builds awareness in our community. I’ve really enjoyed sharing with all of you. If anyone has a comment or question in mind, please be sure to speak up. Let’s all work together to Spread the Word to End the Word!